watering dishes… and you remember that onions are behind every one of them. i didn’t even realize that this recipe’s in laura calder’s book french food at home which i have, because i’ve been that bad about actually using my beautiful cookbooks. but as i’ve mentioned before, i’m making and posting favourite recipes from my collection at the beginning of each month. this will definitely become a favourite. 1. heat the oven to 425°F/220°C. Cut barely a sliver off the bottom of each onion so they’ll sit without rolling over. pierce them in a few places with a sharp knife so they won’t burst during cooking. 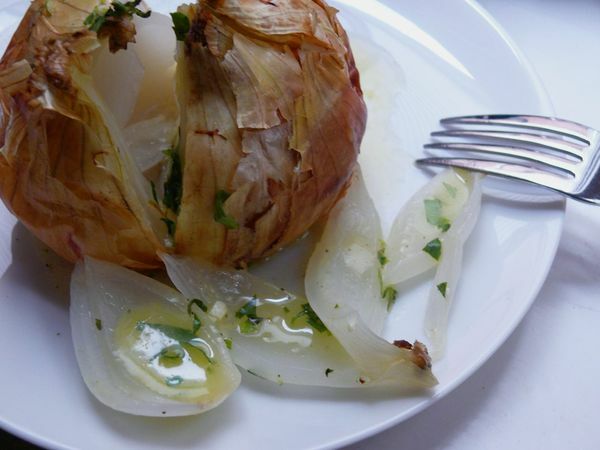 make four mounds of sea salt in a baking dish and nest an onion in each. bake 15 minutes. lower the heat to 325°F/160°C and continue baking until the insides are almost applesauce soft, about 1-1/2 hours, depending on the size of the onions. 2. make the dressing: Whisk together the yolk, garlic and vinegar. season. beat in the oil, drop by drop, to make a thick dressing. taste, and add lemon juice if needed. check the salt and pepper. stir through the herbs. cover and refrigerate until ready to serve. 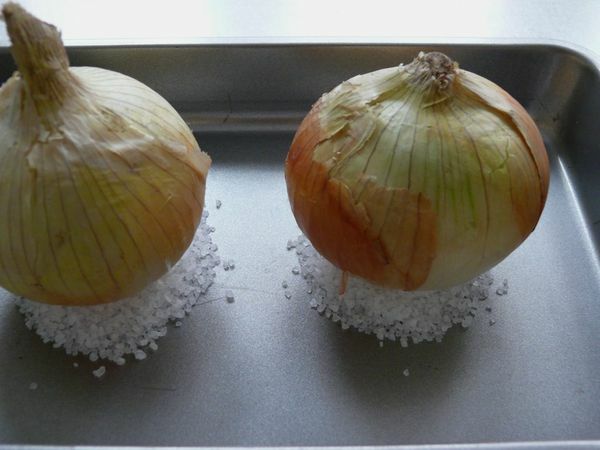 3. to serve, set the onions on serving plates (leaving the salt mounds behind). slit the onions open with a sharp knife and spoon some sauce into each until it starts bubbling up and out onto the plate. serve. This sounds so good and a very unique idea! I just got some Himalayan pink salt and organic peppercorns from Sustainable Sourcing https://secure.sustainablesourcing.com and I think I’ll try them out in this recipe. Thanks for sharing! the second time someone’s mentioned pink salt to me this week! sounds lovely–enjoy! those are the sexiest onions i have ever seen! such beautiful photos, as always. I’d love to try these. They’d be amazing tossed in a pasta with some greens. Lovely! that is a great idea–if you try that, let me know what greens you used? i think it would be nice with some raw herbs too. This recipe is beautiful! I really like the whole idea. This is interesting, too! I lost my recipe, so thank you for this posting. Don’t waste precious pink Himilayan salt, it is only to prop up the onions. I use a very small piece of aluminum foil for this job. This recipe is just great. Onions are a super food and I use these onions chopped also in soup. You can reduce the calories my making a simple dressing with tarragon vinegar, fresh tarragon and a little olive oil and of course a little s&p.